Carlos Gomez was once a top prospect of the New York Mets. He was such a nice prospect that the Minnesota Twins accepted him as the centerpiece of the Johan Santana. This is back when Santana was one of the best starters in the game. He was young but he projected to add power to his already impressive speed on the bases. The Twins never got much out of Gomez who was never better for them than his .291wOBA in 2008. The Twins sent him to the Milwaukee Brewers before the 2010 season for J.J. Hardy and a little cash. The Brewers valued his center field defense and since he was just entering his age-25 season, they could reasonably expect some development of his skills with the bat. But that has not really happened. He has not become more disciplined. He still swings at too many pitches off the plate. He has not improved his contact rate. He has not become more patient. His walk rate has actually gotten worse since 2010. What has improved is his power. Since 2010, Gomez has seen dramatic increases in his Flyball percentage, HR/FB, and his ISO. Just the increased power alone was enough to make him a slightly above average batter for the first time in his career. In just 415 at-bats Gomez set new career highs in batting average, homeruns, stolen bases, and WAR (3.5). For the first time in his major league career, Gomez did not represent a hole in the lineup. He was an asset. Fantasy owners in most leagues made quite a profit by holding Gomez. He could not have cost much as he was trending towards just part-time at-bats and his low batting averages prevented his stolen base totals from increasing or being worth very much. Owners who have him cheaply can keep him with minimal risk because of his low cost. However, he is likely to see his price go through the roof in leagues where he is available, that is probably a mistake. 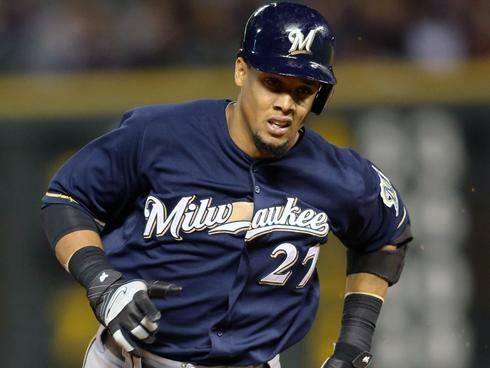 Carlos Gomez does not do any of the things that allow an owner to count on a consistent level of performance. He does not make consistent contact. His plate discipline is as real as the Easter Bunny and he refuses to take a walk. He could bat anywhere from .200 to .270 but do you really want him if he goes back to hitting .220? I doubt it. On the other hand, Miller Park is giving a giant boost to power hitters from both sides of the plate. Over the last three seasons the park has boosted power from the right side of the plate by 28 percent and 30 percent from the left side. While Gomez has clearly benefited from this, it is also clear that his natural power (hopefully) has increased. As long as the at-bats are there for him, Gomez should contribute homeruns and stolen bases. If the average drops back below his career levels (.247) he could find himself back in a part-time role.